I like to muffinize things. I muffinize desserts, like cheesecake, so they are cute, compact and individual sized. I muffinize flavors I enjoy, like apple pie muffins or pancake muffins or donut muffins. You get the picture right? In my quest to muffinize the world, I attempted this Monday to adapt Dorie Greenspan’s Coffee Break muffins and muffinize Vietnamese iced coffee. Imagine thick fudgy coffee and sweetened condensed milk in a fluffy muffin form. Brilliant, I thought. Well the execution was not as brilliant as I would have liked. Don’t get me wrong these were tasty muffins bursting with bigger sweet coffee flavor, there just wasn’t anything Vietnamese about them. I think next go around I will try adding more or stronger Vietnamese coffee and topping the muffins with a sweetened condensed milk glaze. If all goes well I will report back with my muffinized Vietnamese coffee muffins. 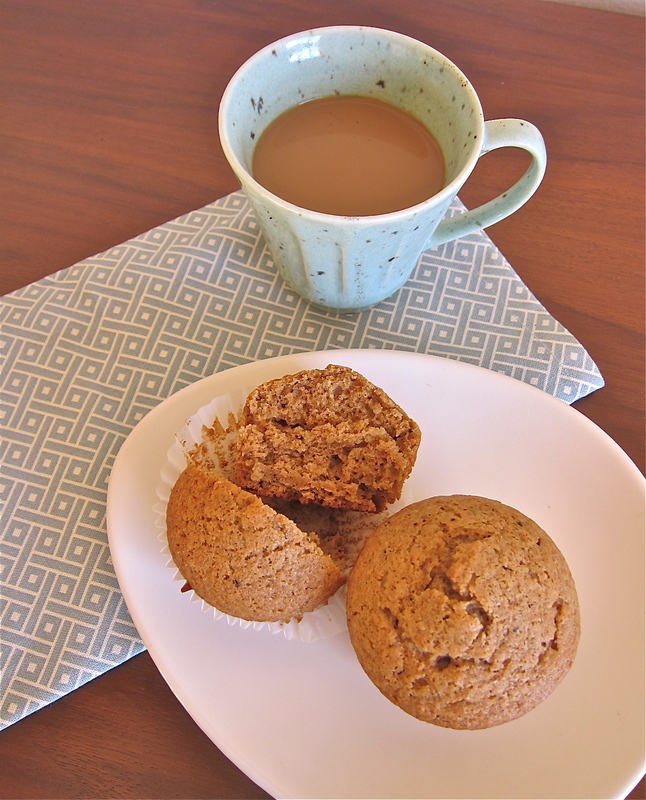 Until them, enjoy these coffee break muffins. They are great with a cup of coffee on your next coffee break! Butter and spray 12 moulds in a regular sized pan or fit in the moulds with paper muffin cups. Place the pan on a baking sheet. In a large bowl, whisk together flour, sugar, espresso powder, baking powder, cinnamon and salt. Stir in the brown sugar making sure there are no lumps. In a large measuring cup or another bowl, whisk the coffee, melted butter, egg and vanilla extract together until well combined. Pour the liquid ingredients over the dry ingredients and with a whisk or a rubber spatula, gently but quickly stir to blend. Don’t worry about being thorough – a few lumps are better than over mixing the batter. Divide evenly among muffin cups. Bake for 20 minutes, or until a knife inserted in the center comes out clean. Transfer the pan to the rack and cool muffins for 5 minutes before carefully removing it from the mould. i like to waffle-ize things the same way you like to muffin-ize them! Vietnamese coffee muffins? I had this same idea a few months ago but never executed. Girl, our minds are MAGICAL LIKE THAT. Here’s to hoping round 2 is a huge success. I love this one. I love your muffinization of all things and I think the recipe looks inspired and delicious! Marissa- italian espresso muffins sound amazing make them and share the recipe! love the muffin monday concept! A- Definitely going to make that glaze next time! I love that you just used the word “muffinize.” 🙂 You’re too cute! And I love your idea for these muffins, even if they didn’t necessarily come out as planned. They sound delicious and should you give the Vietnamese muffinization again, I’ll be on the look out for it. Ah, bummer they didn’t turn out quite the way you wanted, but they still sound good. “Muffinize” is an excellent verb. I also suffer from the horrible muffinizing-disease:) I’m sure the glaze would be great on these. I love them.